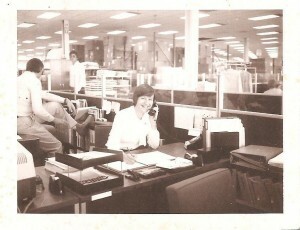 Pam Leitterman at her desk in HP’s Data Terminals Division, Bldg 43U, in 1979. The new Apple campus is being constructed on the former HP site on Homestead Road in Cupertino, CA where Bldg 43 and other HP buildings were located. In July 1979, I embarked on an almost 28-year career with Hewlett-Packard. In my first job, I was a technical marketing engineer for HP’s Data Terminals Division (DTD). One of my primary responsibilities was to train HP Systems Engineers (SEs) on DTD products. HP was booming then and hiring systems engineers at an incredible rate. For several years we conducted new hire SE training on our products almost every other week, 20+ SEs at a time. I supported and delivered training on the 264X terminals. They all featured an 8080 (8-bit) microprocessor and a 15-slot backplane that allowed them to be configured and sold as a series of products with varying degrees of capability. For training purposes, the modularity enabled us to swap out PC boards and key caps to provide hands-on experience with the full product line over a period of several days. Initially, we weren’t aware we might be causing problems for the products due to electrostatic discharge (ESD) that could occur from swapping boards in and out with our bare hands. Later, we learned to wear protective gloves and store our training circuit boards in anti-ESD packaging. HP’s data terminals were primarily used as consoles and data entry devices for computers. However, the terminals also had enough display memory and intelligence that they could be used as standalone word processing devices. In DTD, we often used them this way to create memos and short documents that we printed to an attached daisy wheel printer, saving our data on the mini cartridge tape drives that were available on most of the product line. Each data cartridge could store a whopping 110,000 bytes of information! The 2640A, the first of the 264X terminals from HP was introduced in 1974. It displayed 25 lines of text (80 columns) on its five by ten inch rectangular screen. It initially sold for $3500 but a discounted price of $2640 each was offered for quantities of six. 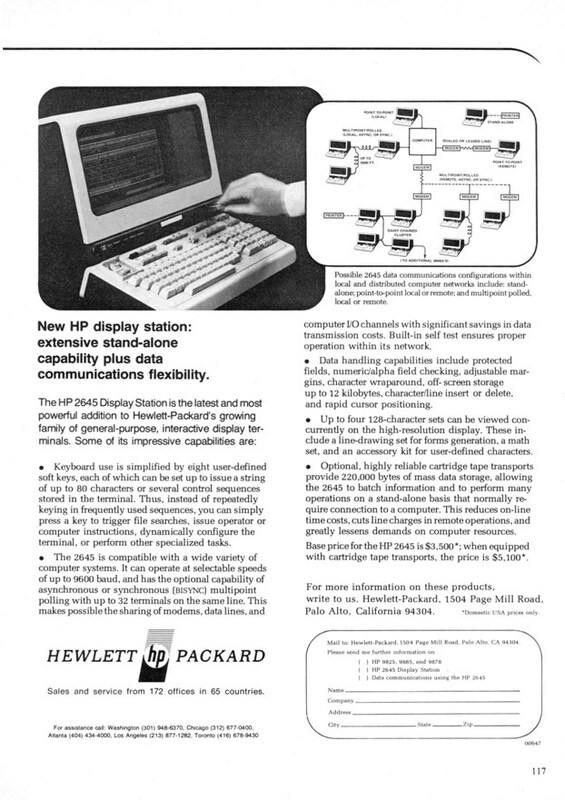 Ad for HP 2640A terminal, Dec 1974. Click picture for full size view. The 2644A was introduced in 1975 for $5000 and included two mini cartridge tape drives. The 2644A was replaced by the 2645A ($3,500 without tape drives, $5,100 with two tape drives) in 1976. The 2645A was the most common of the 264X terminals. Ad for HP 2645 terminal, 1976. Click photo for full page view. 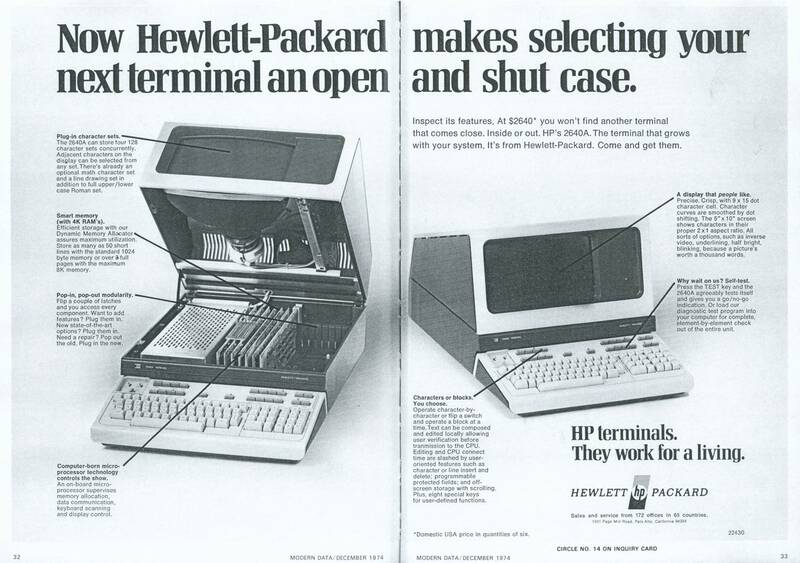 Thanks to hpmuseum.net (a private museum based in Australia and not affiliated with the Hewlett-Packard Company) for refreshing my memory on facts and features of the 264X terminal line, and for the old ads which are posted on their web site.